My name is Dennis Liotta. I’m a partner at Edgar Snyder & Associate, and since 1990 I've been manager of the workers’ compensation and social security disability departments. Why I became an attorney in the first place is that it's an incredibly rewarding profession to be able to help people in such a way that brings a lasting impact on their lives. Back in the 1980s I worked for a prominent Pittsburgh defense law firm and by working on the defense side you got a chance to see things that just really wasn't right, how they took advantage of injured workers. I mean these are people who were injured on the job. They did not go to work that day thinking, “Why, I want to get injured,” and unfortunately the insurance companies and the employers took advantage of them. And so, when Edgar gave me the opportunity to come work on the claimant side, it was an opportunity that I jumped at and I never looked back from that day forward. Attorney Dennis Liotta has helped injured workers and people with physical and mental disabilities in Pennsylvania for over 20 years. He is certified as a specialist in the practice of workers’ compensation law by the Pennsylvania Bar Association’s Section on Workers’ Compensation Law. Attorney Liotta has an AV® Preeminent™ rating from Martindale-Hubbell, the highest possible rating based on legal ability and general ethical standards. He also made the list of Pennsylvania Super Lawyers, an honor awarded to the top five percent of state-wide lawyers, from 2009 - 2018. 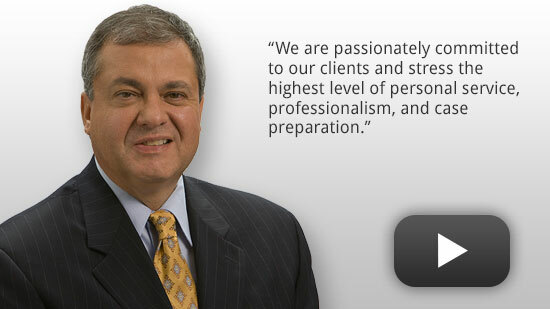 Attorney Liotta was also voted for inclusion in the 2010 - 2019 editions of The Best Lawyers in America®, an honor based on rigorous peer review. Corporate Counsel magazine has called Best Lawyers "the most respected referral list of attorneys in practice." Attorney Liotta received his Bachelor of Arts degree from Duquesne University and a Juris Doctor from the Duquesne University School of Law. He has also completed numerous advanced education training classes in Workers' Compensation and Social Security disability. He is licensed to practice law in all State and Federal Courts of Pennsylvania. Attorney Liotta volunteers for the Make-A-Wish Foundation. He was born and raised in New Kensington, PA, and now resides in Greensburg, Westmoreland County.